Charming & spacious 1920s cottage style house surrounded by 3 acres of lawn, trees and perennial beds in the beautiful area bordering the Stockbridge golf course at the West end of Main Street. An easy walk into town for a drink on the Red Lion Inn porch, and a ten minute drive to the Tanglewood Summer Music Festival or the Stockbridge Bowl for swimming. The house is roomy and comfortable, with books, antique furniture, fireplaces, a piano and wonderful outdoor space, French doors from the living room open to a screened porch overlooking an expanse of lawn and flower beds, and three acres of property offering a unique oasis in town. The porch is also accessible from the kitchen for cookouts. A pretty fence with climbing autumn Clematis surrounds a portion of the grounds creating a space for dogs and children to play. This house has been a favorite of Tanglewood musicians. The cottage has belonged to my family since the 1930s. 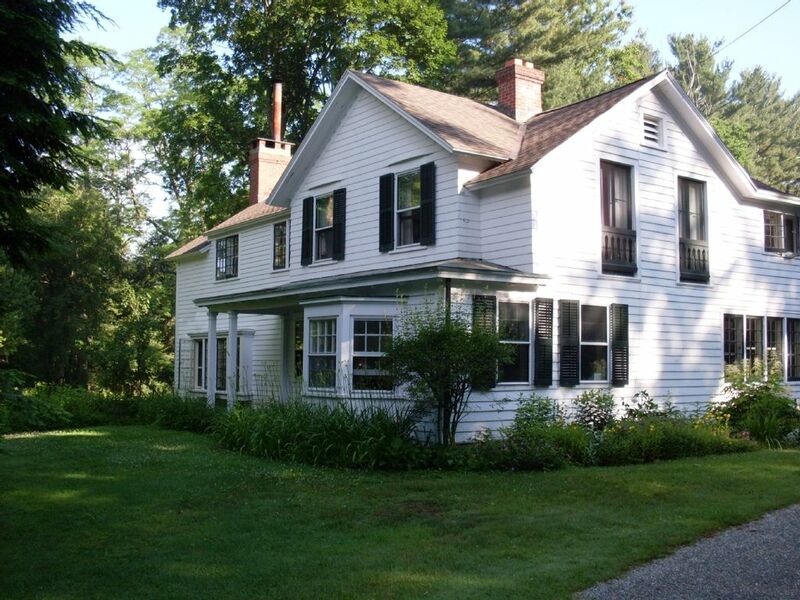 It was used as our guesthouse when I was growing up, then rented, for many years, to pianist Emanuel Axe and his family during the Tanglewood Music Festival's summer season. My husband and I took it over in 2001 when I returned to the Berkshires after years in New York and Boston working in the book publishing business. I now work as a freelance editor and my husband is an artist. The house has tremendous charm and detail and a unique situation in the village, surrounded by three acres of property, and accessible by foot to the village, and to the golf course. Stockbridge is at the center of the Berkshires, 10 minutes from everything: Tanglewood, restaurants in Great Barrington & Lenox, swimming at the Stockbridge Bowl, hiking in Tyringham and Monterey, and a wonderful walk out the back door or to the Red Lion Inn for a drink. A charming historic house in the heart of Stockbridge within walking distance of the Red Lion Inn and surrounded by three beautiful acres of land. The new screened porch adds an outdoor room opening to perennial beds and fenced lawn where children and dogs can play. There are two full bathrooms upstairs with combination tub / showers as well as a half bath so each bedroom (except the small bedroom/dressing room off in master suite) has its own bathroom. In addition there is a full bathroom with bath downstairs. We rented this beautiful home for two summers. The owners are lovely and the house is spacious and comfortable. It includes everything you need with an historic Massachsetts town within walking distance. Wonderful rental experience for my family. We rented this house the past two years for the months of July and August and I can't say enough good things about it. The house is beautiful inside and out and to be so close to town yet have so much house and privacy was incredible. The gardens and lawns were beautifully maintained all summer long and we had many meals on the beautiful patio. The house was immaculately clean and very well maintained and the owners responsive to any requests we had. I highly recommend this house - a very magical place in a perfect location. Stockbridge is a beautiful, historic, New England town in the heart of the Berkshires, and perfectly located for those who want to enjoy the Tanglewood Summer Music Festival, the Berkshire Theater Festival, Jacobs Pillow Dance Festival, the Norman Rockwell Museum, restaurants in Gt. Barrington, hiking, swimming, and all the beauties and cultural attractions of summer in the Berkshires; only ten minutes from Tanglewood, and fifteen minutes from Gt. Barrington.